It is essential to use the correct filters and service intervals to get maximum life and highest uptime from forestry and off road industrial equipment. Forestry and off road industrial equipment often works in punishing conditions. Modern mobile machinery is more efficient and productive than ever. As a result, components are more susceptible to damage from contaminants and far less forgiving of poor maintenance practices. Cleanliness and proper handling of fluids are essential. And filtration is the last line of defense. 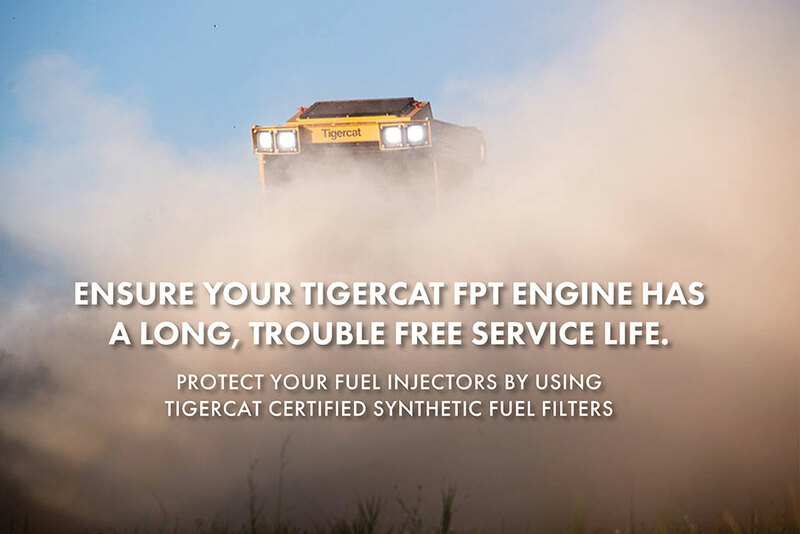 Protect your fuel injectors by using Tigercat forestry fuel filters. Tigercat FPT engines operate at higher temperatures and pressures than previous engines. This means even slight fuel contamination can cause serious engine damage. To keep Tigercat FPT engines running smoothly, it is critical to use fuel filters that meet Tigercat specifications. SOURCE TIGERCAT FUEL FILTERS FROM YOUR TIGERCAT DEALER. Refer to the Operator’s Manual for the correct intervals and remember that the intervals must be matched to the conditions and duty cycle of the machine. Tigercat hydraulic systems are extremely efficient and as a result, quite sophisticated. Components are manufactured to extremely tight tolerances in order to reach productivity and fuel economy goals. Consequently, these hydraulic components demand effective filtration. It is the job of your hydraulic filters to remove contamination from the oil flow. Tigercat machines work in punishing conditions. Proper filtration is essential. HOWEVER, IT MAY NOT HAVE THE SAME PERFORMANCE QUALITIES. Wondering where to get Tigercat fuel filters?